All women desire to have shiny, healthy hair. If you are dreaming to have long straight, and shiny locks, we will provide you with tips on how to make your very own treatment! This all-natural solution is fairly easy to make as most ingredients is highly available at your local grocery store or even at your garden! The onion hair treatment is extremely effective. Dermatologists even reveal that this all-natural solution has not negative side effects on both scalp and the hair. Those who have tried using this treatment witnessed and saw results within a month of regular use and application. 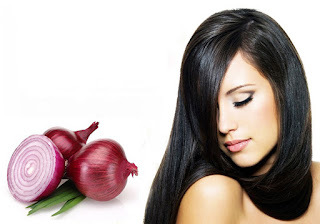 Onions are useful beyond the kitchen as they can be used to nourish the hair and scalp too due to its high sulfur content- a compound that stimulates the production of collagen. As we are all now aware of, collagen is important for hair growth. Take two to four pieces of onions. You may also wish to leave the solution for an hour. Wash you hair as you would normally do with a conditioner. This procedure should be done at least twice a month. Don’t worry as the onion smell will leave your hair and scalp as soon as you wash you hair after the treatment.